How many of these creative photography ideas can you use? But in truth, we all know that the snapshots that we take day in and day out aren't what we would consider creative photos. So, can you learn to be creative? And what's my take on real creative photography? The short answer to the first question is "yes!" you can learn to be creative. And here I'll give you some tips to get you started. And the second question - what's my opinion? Well, I think creative photography is when you photograph something in a way that most people would not normally see. To give you an example, most people walking along a street would not normally see the world from an inch up from the ground. Why would they when their eyes are a good few feet off the floor? Creative photographers would. They would be curious to find out what the world looks like when you look at from the floor. 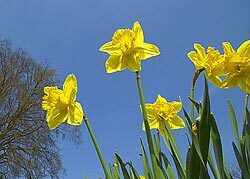 The photo here is one I took of some daffodils, but taken from the perspective of an ant. It's easy to do - just set the self timer on your camera running then place the camera in the flowers. When the shutter fires it will take a lovely shot of the flowers from the ground up. The key point . . . This is the key point. Developing an interest in seeing things in a different way to normal. It could be that you look at something from an unusual angle. This will certainly add an element of creative photography to virtually any photo you take. It also means that you look to place two objects (or more) in your scene that you would not normally find together. The brand new supercar set in a scrapyard, or the tramp sleeping in the doorway of a posh hotel are both classic examples. Now to achieve these simple effects you might need to be creative with photoshop (not many posh hotels will tolerate tramps in the doorway!) but it's easy to do. But this might be missing the point a bit - creative photography is where you have thought about creating the image, not necessarily doing it. The fact that you considered it means that you are starting to think creatively. 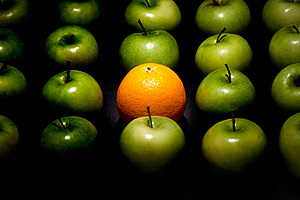 The example here is a simpler take on this theme (an orange sat amongst apples (from rimagine.com)) but the idea is the same - something placed where you would not normally expect to find it. One thing that helps of course is to see other photographers creative work. It stimulates the creative mind! There are plenty of creative ideas in this little eBook. Once you have grasped the key point that creative photography involves looking at a subject in a way not normally seen you are then ready to explore further. There are things that are not normally seen by people because they simply happen too fast. 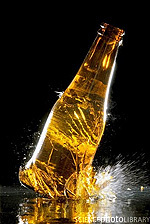 The smashing of a glass bottle for example. Normally (and very sensibly I might add!) if a bottle falls on to the floor your eyes shut so that you don't get showered by glass. But thinking with your curious hat on - what does that bottle look like the moment it hits the floor? The photo here (from sciencephoto.com) shows exactly what happens. Be under no illusions - this is not an easy photo to create. It involves using sound sensitive flashes to capture the moment of impact. But again, the important thing is that you thought of capturing something that the eye does not normally see. Without the aid of sophisticated equipment you can always use the shutter speed on your camera to capture movement like this. I captured the droplet here using nothing more than a tripod (to hold the camera still) a cup of liquid - in this case it was a cup of tea - and some trial and error! There's lots more on how to use shutter speed creatively here. If fast shutter speeds freeze movement, what about slow shutter speeds? They can certainly be used for creative photography and the important point again is seeing something that you would not normally see. Using a slow shutter speed captures blurs. But importantly anything stationary in the scene comes our normally - it's just the things that move that blur. Your eye would never normally see this. Unfortunately (or perhaps fortunately!) your eye sees everything the same, and it can't record a few seconds at a time to play back later. 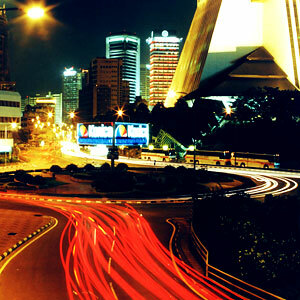 The trick is to sit your camera on a tripod (or something solid) and use a shutter speed of a good few seconds. Point it at your chosen subject (ensuring you have chosen something where there is actually movement) and fire the shutter. Fixed objects will come out sharply and anything that moves will be a blur. A real classic creative photography technique that exploits this is painting with light. And there are lots and lots of examples of painting with light in this photography eBook. Another really simple technique for creative photography is to play with perspective. Who hasn't tried the old 'pushing the Tower of Pisa back up' photo? (the concept is basically that things in the foreground are larger than things in the background). 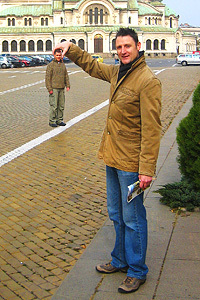 The photo here is of me 'holding' up a miniature friend. He's actually carefully positioned about twenty feet behind me - so he's in the background and appears smaller. This is a creative photography technique that you don't need any special equipment for - just a bit of creative thinking. Going right back to the start - creative photography can be simply looking at something from a fresh perspective. Repeating patterns are particularly good at this. Line up a set of repeating patterns in the viewfinder and you have got yourself something creative. The photo here is a stairwell of a hotel I was staying at in Rome. 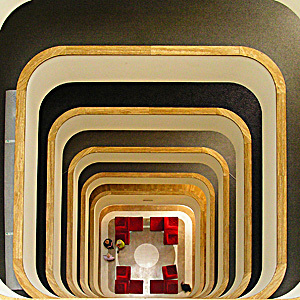 Stairwells are a good source of material for this type of creativity because they offer a repeating pattern and depth. The thing that makes this creative is again simply looking at something in a slightly unusual way.